Katy from Hot Pink Wellingtons surprised me with a tweet the other week. It was about Liebster awards. And she was giving me one! Once I’d read her blog post that explains it all, I was super flattered and very thankful that she considered me worth a mention! 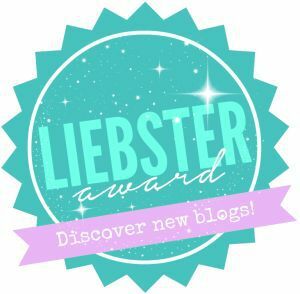 It’s a blogger to blogger award, recognising and supporting each other! What a great sentiment-kind of like a lovely blogging baton! Well, that was now two weeks ago, and I have finally sat down (with THE most glorious apple hot cross bun…it’s so fruity it’s basically a health food) to answer her questions and also to pass the Liebster on to some of my favourite newer blogs too! I’d spent a lot of time reading various blogs when pregnant and loved that mums were recording their lives with their children. What a lovely thing to look back on- far better than a baby book in a lot of ways, and a lot more sociable too. I decided I would join in. There’s a very friendly community amongst parent bloggers- it’s very welcoming. Plus, I get the chance to record these early years in a fun way. Make regular posts and interact more with other blogs! At least 2 posts a week I think is realistic, hopefully 3. 3.) What activities do you enjoy outside of blogging? I love eating. I’m a professional luncher and dinner-er. I love markets. Do baby groups count now? If so, I really do like some of them- especially ones at galleries and museums. I also like watching TV. It’s an activity, ok?! I enjoy a walk around with the pram. I like shopping for small things. In particular baby clothes. I just do something else. I go outside, I play with my child and I enjoy every second of maternity leave! 5.) Are you an introvert or an extrovert? I love my own company however I am at my best when surrounded by people, the buzz of everything around me, interacting with others. Extrovert I think. 6.) What are your three favourite blogs to follow? Like I can pick just 3!! Umm, if pressed I’d have to mention Katy who nominated me obviously, the lovely parenting in pyjamas and also the blogs I have listed below for Liebsters themselves! Also, not a blog but a Twitter account “Can Mummy Pee Too?” as I think it’s bloody genius. We all need to know where we can change a baby AND pee, it’s one of my basic needs when I’m away from home! 7.) What advice would you give to a new blogger? Talk to people online. Write about things that you want to. Enjoy it. I have a day job that I’m returning to at the end of June, weep! But only part time so hoping to have myself a slice of good old work/life balance! 9.) What is your favourite post on your blog so far? I use Twitter mainly. I have a Facebook and also an Instagram which I’m slowly building up! Why did you decide to start blogging and what do you like to write about? What, if any, blogging goals do you have? Which other blogs do you enjoy a read of? What else do you like to do with your free time apart from blogging? Would you have any top tips for people starting a blog or thinking about starting a blog? Which social media platforms do you use? Which do you find the most social? Have you any funny parenting stories to share? 2 – Display the award on your blog. This can be done by including it in your post and/or displaying it using a widget (note: the best way to do this is to save the image to your own computer and then upload it to your blog/post). 3 – Answer the 10 questions about yourself that your nominating blogger chooses for you. 4 – Create a list of questions for your nominated bloggers to answer. 6 – Inform the blogs that you nominated that they have been awarded the award and provide a link for them to your post so that they can learn about it. Aww, thanks for taking on the challenge! Lovely to read these and get to know people a bit better!